We're proud to announce that Brooks is the recipient of another award this year. The 2011 Innovation Award from Flow Control magazine joins our Golden Gas Award and Control Readers' Choice Awards from earlier this year. 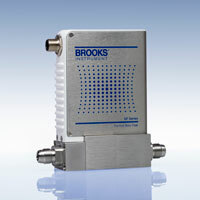 The Innovation Award recognized Brooks for our GF Series thermal mass flow controllers. These are highly modular, user-programmable, ultra-high purity devices designed for advanced semiconductor and thin-film processes. The GF Series has changed the mass flow industry by offering customers the ability to select new gas calibrations and full scale ranges without the cost of removing the mass flow controller from the gas line.The GF Series builds upon Brooks' expertise in pressure transient insensitive (PTI) technology by minimizing process gas flow variation due to pressure and temperature fluctuations. We engineered it for long-term reliability with embedded diagnostics and automated zoning to reduce maintenance for a lower cost of ownership. We're honored that Flow Control's Innovation Awards recognized Brooks for our contribution to the semiconductor industry.